I keep wondering why I seem to accomplish so little. Am I inefficient? Too distractible? Overbooked? All are decided possibilities, however I observed my thoughts recently. Eight separate "Oh! I have to do this" ideas flitted by in about 3 seconds. Maybe I'll hold on to one or two long enough to write down. The rest are gone until they come around again. Making lists is helpful until I end up with various sizes of paper covering my desk, each with a few items checked off. 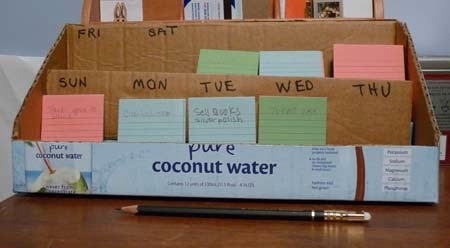 I've seen systems where each task is on its own paper and everything is put in a file box with days-of- the-week dividers. This does not address the visibility issue. It's too easy to never open the file box. What I needed was a system with each task on its own paper and filed so each day was visible. A task could be assigned to the day it needs to be done and there is time to do it. If a task is not accomplished it can be moved to a different day. Things that are done everyday or several times a week can be moved as they are completed for that day. Searching the web didn't turn up anything like what I envisioned. So I made my own out of a box, some heavy paper for the dividers and glue. Now when I have one of those many thoughts zooming through my head I can catch it on a half index card and assign it to a day. There are extra slots for blank cards and "Someday Projects", things requiring either more time or research. If it works and I actually use it, I might pretty it up or re-build it. This one is rough but I was more interested in getting up and running to see if it will actually be helpful. It is already a success in one way; my desk looks terrific.